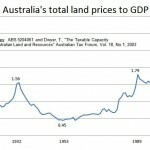 Dr Gavin Putland shows real wages and salaries to GDP have been kept down in Australia, as elsewhere, because land prices to GDP have been up enormously. You can’t have them both up together. When Australians appreciate this simple fact, they may begin to see the warm inner glow they feel when their property values escalate upwards rapidly is sorely misguided. But as our love affair with real estate is often irrational, I’m betting most of us will be unable to accept the point. This is the crux of failing economies.